Most women would like to have a slim waistline, but belly fat is more than just a cosmetic problem. Excessive abdominal fat increases your risk for chronic diseases, such as heart disease and diabetes. There are ways to combat belly fat, however, and understanding the causes of abdominal fat gain may help you prevent it. 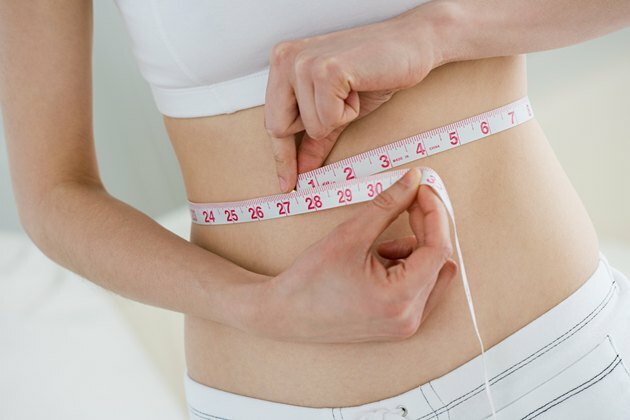 The most obvious factors that can cause belly weight gain are a lack of exercise and poor diet. Excess calories in the diet, specifically from sugar and starch, can cause the body to store fat. Consuming a higher-protein diet may help shed abdominal fat, compared to a lower-protein diet, according to a 2002 study published in Diabetes Care. Get your carbs from nutrient-rich foods such as legumes, fruits and unprocessed whole grains. Limit sugar and focus on incorporating healthy fats like olive oil and avocado rather than saturated fats. A sedentary lifestyle increases fat storage, while vigorous exercise releases catecholamines -- hormones that are effective at burning abdominal fat. Thirty to 60 minutes per day of moderate-intensity exercise can help combat belly fat, according to Harvard Medical School. These lifestyle changes tend to reduce visceral belly fat, the inner fat that surrounds your organs, which is more dangerous to your health than the pinchable layer of fat under the skin. Women with higher levels of the stress hormone cortisol have more abdominal fat, according to a study published in Psychosomatic Medicine in 2000. Stress is associated with greater belly fat in all women, both thin and overweight. Cortisol influences your waistline by directly affecting fat storage while increasing your appetite and sugar cravings. Be proactive about reducing the stress in your life if you want to keep your waistline trim. Getting a proper amount of sleep is necessary to manage cortisol levels and prevent belly weight gain. A healthy diet, exercise and stress-management techniques like yoga and deep breathing are effective methods of keeping cortisol levels under control. Insulin is a hormone that enables your body's cells to use sugar in the bloodstream as energy. Insulin is also a fat storage hormone, however, so when high levels of insulin are circulating in the bloodstream, your body is more likely to store belly fat. A diet high in sugar and refined carbohydrates, combined with a lack of exercise, can cause high insulin levels and, eventually, insulin resistance. Your body depends on carbohydrates as an energy source, but if you consume more than your body can burn, the excess will be stored as fat. To lower insulin levels and prevent belly weight gain, bump up the protein in your diet and limit carbohydrates from sugar and white-flour products. The hormones estrogen, progesterone and testosterone have a significant effect on fat storage in women. Estrogen and progesterone both limit fat storage, while high levels of testosterone increase belly fat. As estrogen levels decrease, fat storage in the belly increases, according to a 2013 study published in Diabetes. These hormonal changes are responsible for the belly weight gain that sometimes accompanies perimenopause and menopause. Talk with your doctor if you suspect a hormonal imbalance is responsible for your weight gain. Hormone replacement therapy may prevent weight gain. In addition, regular exercise and a healthy diet can help combat belly weight gain, even if hormones are to blame.